Domino is a 2005 action crime film directed by Tony Scott with a screenplay by Richard Kelly from a story by Kelly and Steve Barancik. An international co-production between France, the United States, and the United Kingdom, the film is inspired by Domino Harvey, the English daughter of stage and screen actor Laurence Harvey, who became a Los Angeles bounty hunter. Its plot flashes back as Domino (Keira Knightley), fashion model turned bounty hunter, narrates how a $10,000,000 robbery came about 36 hours before. Supporting actors include Mickey Rourke, Edgar Ramirez, Delroy Lindo and Mo'Nique. The film is dedicated to Harvey, who died at age 35 from an overdose of fentanyl on June 27, 2005, a few months before the film was released. Domino Harvey, a bounty hunter, has been arrested by the FBI, investigating the theft of $10 million from an armored truck. She is interviewed by criminal psychologist Taryn Mills and tells her everything she knows about the case. Domino explains her profession and the events leading up to the theft with Mills occasionally prompting her to give more detail. Domino is a former model living in Los Angeles who becomes a bounty hunter when, after being kicked out of college, she notices a newspaper advertisement for a bounty hunter training seminar. Her colleagues are Ed Moseby, Choco and Afghan driver Alf. They are employed by Claremont Williams III, a bail bondsman who also runs an armored car business, and whose mistress, Lateesha Rodriguez, works for the California Department of Motor Vehicles. Lateesha's granddaughter Mica is suffering from a blood disease and needs an operation that costs $300,000. Claremont sets up the robbery of $10 million from Drake Bishop, the owner of the Stratosphere Hotel and Casino in Las Vegas and a client of Claremont. His bounty hunters would return the stolen money and collect a $300,000 finder's fee from Bishop. Lateesha has been running a counterfeit driver's license racket at the DMV. A teenager named Frances arrives at the DMV and asks Lateesha for fake licenses for himself, his brother, and two of their friends. The FBI are tipped about Lateesha's racket. They threaten to send her to jail unless she gives them information about Frances, whom they have been surveilling. Lateesha throws them off the trail by saying that Frances, his brother, and his two friends are going to commit the armored car robbery, when in reality she and Claremont are doing it themselves. Lateesha carries out the robbery with the help of three co-workers. Claremont finds that Frances and his brother are the sons of mafia boss Anthony Cigliutti. He phones Lateesha and tells her to abort the plan, leaving the money with getaway driver Locus Fender, who takes the money to his mother's trailer home. Claremont has the bounty hunters apprehend Frances, his brother and his two friends and then tells them to deliver them to men working for Drake Bishop. Claremont tells them to retrieve the money from Fender and to deliver it to Bishop at the Stratosphere Casino. Following a shootout with Fender's mother, the money is retrieved. Cigliutti is told about his sons' arrest and is led to believe that Bishop had his sons killed. In reality Bishop's men released the boys after learning that they did not know anything about the robbery. Believing his sons dead, Cigliutti wants revenge and heads for the Stratosphere. In Las Vegas, Domino takes $300,000 of Bishop's money and gives it to Lateesha for Mica's operation. At the Stratosphere, the bounty hunters meet with Bishop, who has an armed crew with him. Domino and Bishop discuss the money and what should happen next. Alf has stolen the money and filled the sacks with plastic explosives. He then reveals that he has the remote detonator taped to his hand, and has shipped the money to aid freedom fighters in Afghanistan. Shortly after this revelation Cigliutti turns up with his crew. Though Bishop denies he had Cigliutti's sons killed, Cigliutti shoots him. In the ensuing gunfight Choco and Ed are severely wounded, but make it into the elevator with Domino. Alf blows up the top of the Stratosphere and Domino is the only survivor. After telling Taryn Mills everything, Domino is released by the FBI. Mills advises her to retire from bounty hunting. The money in boxes is delivered to Afghanistan and opened by celebrating children in the streets, Mica gets her operation, and Domino shares a moment with her mother. Keira Knightley as Domino Harvey. Tony Scott thought of Knightley for the role after seeing her in Pirates of the Caribbean: The Curse of the Black Pearl. Mickey Rourke as Ed Moseby. Rourke initially turned down the film, describing the part of bounty hunter Ed Moseby as "one dimensional". He agreed to do the film when Tony Scott had the role rewritten. Brian Austin Green, Ian Ziering, Jerry Springer appear as themselves. In 1994 director Tony Scott was sent an article from the British newspaper The Mail on Sunday by his business manager Neville Shulman. 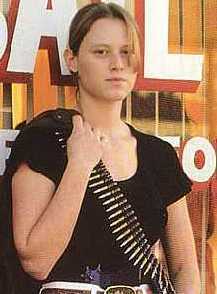 The article, written by Sacha Gervasi and titled My gun for hire: Why a movie star's rebel daughter turned into a bounty hunter, was about an English woman named Domino Harvey who was working as a bounty hunter, apprehending fugitives who had skipped bail for the Celes King Bail Bond agency in South Central Los Angeles. While Harvey was one of the few female bounty hunters, what caught the attention of Shulman and Scott was that she was the daughter of the late actor Laurence Harvey. Tony Scott tracked Domino to Beverly Hills, where she was living at the time with her mother Paulene Stone and Stone's then husband Peter Morton. He invited Domino to his office, where he proposed a film of her life. Domino agreed and sold Scott the film rights. According to the Los Angeles Times, Harvey was paid $360,000 for the rights. Tony Scott interviewed Harvey about her life and her work bounty hunting. Scott also met and interviewed Ed Martinez and Choco, who were Domino's bounty hunting colleagues. She took him to meet Celes King III, the bail bondsman they worked for. 20th Century Fox, which had a first refusal deal on the project, turned it down and in the end the film was financed by New Line Cinema. Steve Barancik wrote the first draft of the screenplay, in 1997 which Scott rejected. A second script was written by Roger Avary, but was also rejected by Scott. Scott described the two rejected screenplays as conventional biopics of Domino Harvey's life, which was not what he had in mind. Finally, Richard Kelly was asked to write the screenplay after Scott read his script for Southland Tales. Kelly was sent transcripts of Domino Harvey's interviews with Tony Scott, but he did not read the scripts that Scott had rejected. In discussing the finished product, Kelly commented that "...Domino might be one of the most subversive films released by a major studio since Fight Club". Filming began in Los Angeles, California, on October 4, 2004. Filming locations included the Ambassador Hotel, the Hotel Alexandria, and The Wilshire Grand Hotel. Scenes were also shot at the Santa Monica Department of Motor Vehicles. Filming moved to Nevada in early December 2004. Scenes were filmed at the Valley of Fire State Park, as well as Hoover Dam and Needles, California. During the final week of production, scenes were filmed over six days at the Stratosphere Hotel and Casino in Las Vegas. Interior shots included the resort's Top of the World restaurant, which was closed at the time for renovations. The Stratosphere was not in the original script. Executive producer Barry Waldman met with the casino's owners in summer 2004 to discuss featuring it in the movie, which the owners agreed to after small changes were made to the script. Tony Scott said an eight-minute BMW commercial he shot at the resort was "a testing ground" for Domino. Scenes were filmed at the Bonnie Springs Ranch motel on December 20, 2004. Scott had wanted to include the ranch and the Valley of Fire in one of his movies. The following day, scenes were filmed at the Stardust Resort and Casino's Starlight Lounge. Filming concluded on December 22, 2004, after scenes were shot at the intersection of South Las Vegas Boulevard and Sahara Avenue. Filming lasted a combined total of 62 days. The release date of the film was announced and delayed several times. The original release date was August 19, 2005. On May 22, 2005, the release date was changed to November 4, 2005. On June 28, 2005, a day after Harvey's death, the release date was changed to November 23, 2005. On July 11, 2005, it was moved to October 14, 2005, which was the date the film was released on. The film had its premiere on October 11, 2005 in Los Angeles. The film was released on October 14, 2005 in 2223 theaters across America and grossed $4,670,120 on its opening weekend. The film stayed in release for four weeks and ended up with a gross of $10,169,202. In other territories, the film grossed $12,775,300 which, added to the domestic gross, gave the film a total worldwide gross of $22,944,502. This was a box office flop compared to the film's estimated $50,000,000 budget. Domino received mostly negative reviews. Review aggregate website Rotten Tomatoes gives the film a score of 19%, based on 151 reviews, with an average rating of 3.9/10. At the website Metacritic, which assigns a rating out of 100 to reviews from mainstream critics, the film has received a rating average of 36, based on 36 reviews, which it ranks as "generally unfavorable". Owen Gleiberman in Entertainment Weekly gave Domino a 'D' grade, describing it as "trash shot to look like art imitating trash". Gleiberman criticised the plot as "so dense with ersatz Elmore Leonard convolutions that it manages to stay three steps ahead of the audience and four steps behind common sense". Kenneth Turan in the Los Angeles Times also criticised the story, saying that the film was "so over-plotted that it's borderline incomprehensible". A more positive review came from Jeff Otto at IGN who praised the film for originality and also praised the acting. Otto stated that "the final result is a bit of a mess, but it's one hell of an entertaining mess". Roger Ebert of the Chicago Sun-Times also wrote a positive review, giving the film three stars and saying he admired it. The film was among Tony Scott's favourites of his own films, although he was also very critical of it, saying, "I didn't let the movie breathe enough. The script was great – Richard Kelly wrote a great script – and I got overcome by the insanity of the world I was touching. I think I fucked up on that one." The film was released on DVD on February 21, 2006. The DVD contained several extra features including an audio commentary with Tony Scott and Richard Kelly, deleted scenes from the film, featurettes on Domino Harvey and the visual style of the film, the teaser trailer and the theatrical trailer. While the film was released in its original widescreen format in all DVD regions, the film was also released in a fullscreen format on Region 1. The film was released on Blu-ray on January 20, 2009. ^ a b c d "Domino (2005)". British Film Institute. Retrieved 23 June 2017. ^ Hewitt, Chris, Scott of the Kinetic Archived October 14, 2012, at the Wayback Machine, empireonline.com, retrieved June 2, 2009. ^ "Domino" Interviews:Mickey Rourke and Edgar Ramirez Archived May 2, 2008, at the Wayback Machine, Hollywood.com, retrieved June 9, 2008. ^ Summers, Chris When hunting people is a career, BBC News Online, October 12, 2005, Retrieved May 21, 2007. ^ Lee, Chris, The Fall of a Thrill Hunter, The Los Angeles Times, July 22, 2005, Retrieved May 24, 2007. ^ Hart, Hugh, A rich, beautiful bounty hunter, sfgate.com, October 9, 2005, retrieved June 9, 2008. ^ Mayflower, Darwin, "TOP TEN UNPRODUCED SCRIPTS" Archived December 17, 2010, at the Wayback Machine, screenwritersutopia.com, 8/8/00, retrieved March 15, 2011. ^ Barancik, Steve, "Domino", www.faqs.org, retrieved April 9, 2011. ^ Knowles, Harry, "Harry looks at Richard Kelly's script for DOMINO a film by Tony Scott! ", www.aintitcool.com, 13/2/03, retrieved April 9, 2011. ^ Domino Production Notes keiraweb.com Retrieved May 18, 2007. ^ Murray, Rebecca, Richard Kelly Discusses "Domino", "Working with Tony Scott, and "Southland Tales", About.com, August 30, 2005, Retrieved May 24, 2007. ^ a b c Domino Production Notes: About The Locations, www.CinemaReview.com, Retrieved October 14, 2014. ^ a b Stanley, T.I., Stratosphere Casino Lands Explosive Movie Promotion, Advertising Age, October 26, 2005, Retrieved October 14, 2014. ^ a b Clarke, Norm. Scott Scouted Vegas, Las Vegas Review-Journal, August 22, 2012. Retrieved October 14, 2014. ^ a b c Cling, Carol. Shooting Stars: "Domino" to leave, "Dan Show" arriving soon, Las Vegas Review-Journal, December 20, 2004. Archived January 12, 2005. ^ Domino promotions page, keiraweb.com, retrieved October 4, 2007. ^ Box office/business for Domino Internet Movie Database. ^ "Rotten Tomatoes". Retrieved September 15, 2011. ^ "Metacritic". Retrieved September 15, 2011. ^ Gleiberman, Owen (12 October 2005). "Domino Review". Entertainment Weekly. Retrieved October 25, 2012. ^ Turan, Kenneth (14 October 2005). "It can't bail itself out". Los Angeles Times. Retrieved October 25, 2012. ^ Otto, Jeff (13 October 2005). "Domino". IGN. Retrieved October 25, 2012. ^ Ebert, Roger (13 October 2005). "Domino review". Chicago Sun-Times. Retrieved October 14, 2014. ^ Smith, Adam. "Tony Scott On Tony Scott". empireonline.com. Retrieved October 26, 2012. ^ Rich, Katey (12 June 2009). "Interview: Tony Scott". CinemaBlend.com. Retrieved October 21, 2015. ^ Domino (US BD) in January dvdtimes.co.uk retrieved February 9, 2009.